1. You can choose Ohio’s drug treatment and sentencing policy. Voting yes on Issue 1 will bring immediate, real change to how Ohio deals with drug addiction. If this amendment passes, we will spend less on housing low-level nonviolent offenders in overcrowded prisons—then fund treatment and recovery services with the savings. 2. Close races and very different options. Suspense? Check. The vote margin between two futures is likely to be very narrow. Richard Cordray has committed to defending hard-won rights if elected governor: healthcare fairness for pre-existing conditions, union workers’ rights, access to abortion, equal protection for LGBTQ communities. Mike DeWine would abandon all of these to corporate lobbyists and religious extremists. 3. 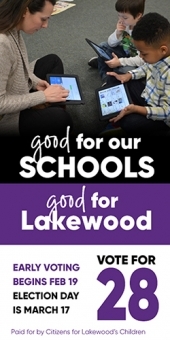 What’s at stake for Lakewood. Will cities be a partner for Ohio government, or just a piggy bank? Streets, senior services, transit, schools, etc., have all been shortchanged as recent state budgets withheld local government funding, and kept it in Columbus. Local elected officials from both parties have said it’s unfair. Cordray is committed to fixing this, but DeWine won’t. 4. Voting takes about 14-minutes, and affects four years or more. The 2012 nationwide average for voting was barely 14 minutes. In Ohio there’s early voting every day through Election Day, either by mail or at the County Board of Elections. Most of Lakewood lives a short walk from their local polling place. In about 14 minutes you can have a real say on national government, state government, courts, and the direct initiative of Issue 1. Not everyone gets to have this kind of say. Please use it, vote your values, and do one thing that really matters for you and those around you. Benjamin Franklin famously said that, “In this world nothing can be said to be certain, except death and taxes.” In Lakewood, the certain death of our hospital is our mayor’s ambition. He rejoices in the death of our hospital, despite the fact that the City of Lakewood had iron-clad contracts assuring that our hospital would be in operation as a full-service facility providing medical and surgical services to our citizens until 2026, eight years from now. He rejoices in the death of our hospital, despite the fact that the hospital contracts provided seven million dollars for indigent medical care. He rejoices in the death of our hospital, despite the fact that Lakewood stroke victims are no longer within two minutes of emergency hospital care. Why Does Lakewood City Council Support Cuyahoga County Council Bag Fee? I have some questions about the article "City Council Supports County's Proposed Fee on Plastic Bags" (2-20-2018), by Matt Kuhns, concerning Lakewood City Council's support of Cuyahoga County Council's proposed plastic bag fee. Lakewood's Ohio State Senator Mike Skindell tried to save Lakewood hospital and keep it open. Lakewood city councilman Tom Bullock voted twice, as a Lakewood Hospital Trustee, then as a Lakewood councilman, to close it - destroying your hospital which many thousands of people in Lakewood and surrounding areas need. Who Stood Up For Lakewood? Remember the kefuffle a couple of years ago about saving our hospital? While you almost certainly do, you might not remember who stood with Lakewood and who stood with Cleveland Clinic. Their candidacy for state representative may refresh your recollection. My name is Martin J. Sweeny and I am asking for the privilege of serving as your next State Senator. Throughout my life, Lakewood has always been special to me. I competed in many basketball games as a teenager here, worked my first job at the Convenient Mart behind Harding, learned to play pool at Mahall’s, socialized at the old Tam O’Shanter, and spent many 4th of July nights down at Lakewood Park watching the fireworks. More importantly, it is where I met my beautiful wife Kate at her family home on Narragansett Ave.
Having had the opportunity of serving our communities for over twenty years, as both a Cleveland City Councilman and a State Representative from the 14th House District, I uniquely understand the challenges facing large, urban cities like Lakewood. From the loss of critical funding for our local schools and cities, an Opioid Crisis ravaging our communities, and a near constant Republican-led assault on the basic rights for all Ohioans, I know the issues impacting you and your neighbors in Lakewood. I promise I will always work hard for you in Columbus to ensure we have strong communities, safe neighborhoods, and are protecting the rights of working families. I’ve had the privilege of calling Lakewood my home for the past 10 years. I run a business here, my husband and I own a home here, and we are raising our family here. I’m proud to be represented by Tom Bullock, and proud to support him in his campaign to be the next state representative for Ohio's 13th district. Tom believes that strong families thrive in vibrant, dynamic, diverse cities. He has worked tirelessly to create a safe multimodal city. One that works not just for our current modes of transportation, but with an eye to the future as well. Thanks to Tom’s efforts on City Council, it’s not unusual to see families like my mine riding their bikes to Lakewood Park, or strolling to the Sweet Spot for an after-dinner treat. It has been said that "The trouble with trouble is, it starts out as fun." Many of us know too well the reality of this statement through our own experiences with trouble. We often overlook the long term consequences for short term profit and pleasure. As I sit back and evaluate why my family chose Lakewood as our home, I can see what drew me to this community were often things that Mike Skindell promoted or helped create as a result of his representation of Lakewood. The November 24 web page of the Lakewood patch proclaims, “Lakewood Diversifying Housing Stock, Building ADA-Friendly Homes.” From the article it should read “home” in the singular. Let me start by stating that Lakewood, being an inner ring suburb, is pretty easy to get around if you are in a wheelchair or have any other mobility issues. I do appreciate the city leveling off the sidewalks, as I am sure parents with strollers and kids on bikes do. We do have some good services here and the newer architecture and venues can be navigated with relative ease in places like Lakewood and Madison Parks, city buildings and supermarkets. The current Council's latest "accomplishment" - the Medical Marijuana Ordinance - clearly shows that each of the Council members is out of touch with us common people, that they don't "get it," and shouldn't continue in office. State Issue 2 is a simple, sound measure to reduce what Ohio’s government pays for prescription drugs. It’s good for those most in need, including people on Medicaid. It’s good for taxpayers, who are currently overpaying pharmaceutical companies by hundreds of millions of dollars per year. If Ohio votes yes on Issue 2, drug companies will no longer be able to charge state agencies higher prices than they charge the Department of Veterans’ Affairs. That’s Issue 2. It’s a simple, modest measure that won’t directly affect many of us at all. It won’t affect Medicare enrollees, or those with private insurance. Prescription drug prices are out of control, however, and even pushing back in this limited way will save the public nearly $400 million every year. Supporting Issue 2 is the common sense choice. If Issue 2 were in place now, repealing it would seem perverse. Why would we insist that our public agencies pay whatever price the pharmaceutical companies demand, instead of negotiating to save money? Right now that’s exactly what we do, and it needs to change. Issue 2 will change that, for the better. Ohio’s Medicaid program and other agencies shouldn’t have to pay more than the VA pays. If we vote yes on Issue 2, they won’t have to. The campaign against Issue 2 is designed to make this simple solution confusing, and we shouldn’t let it work. Medicare and private insurers have price agreements in place, independently, and pharmaceutical companies can’t suddenly change that. Drug research is largely performed by universities and other public institutions funded by our taxes. Lower profits for the drug companies won’t change that; in fact, big pharmaceutical companies can easily afford to trim their profits’ growth. Success for Lakewood comes down to people. A city is truly flourishing if it’s working for all, and right now that isn’t happening. More people move out of Lakewood than move in. Those of us running for City Council At-large this year agree on some things. At recent forums all of us agreed that opioid addiction is a challenge Lakewood hasn’t met so far. But I can’t agree with the claim that “we’re growing.” Because I see Lakewood as a community of people, above all. And that community isn’t growing. U.S. Census numbers for Lakewood are in decline. That means it’s true that, as another candidate said, “people are voting with their feet.” But Lakewood is losing that vote. When the next census counts those votes, we could fall below 50,000 people and lose federal funding. When my wife and I decided to move to Greater Cleveland from outside of the area in 2012 we chose Lakewood in part because of its reputation as a "progressive" suburb. At first we found this characterization to be accurate, at least superficially. After all, every elected official, and pretty much every voter, in Lakewood identifies as a Democrat. Lakewood's Representative in the Ohio General Assembly is the first openly gay person to serve in the Ohio House of Representatives. Lakewood voted overwhelmingly for Obama in his 2012 re-election campaign, an effort I worked on as a Field Organizer. However, a series of subsequent events, and learning a bit more about the recent history of Lakewood, led me to view the "progressive" reputation of Lakewood as largely a facade. The main event will be very familiar to Observer readers: the city's handling of the Cleveland Clinic/Lakewood Hospital issue. Without getting into the weeds of that controversy now, I was flabbergasted at the extent to which every single elected official in Lakewood simply rolled over and did whatever corporate and real estate interests wanted, not even really attempting to negotiate a better deal for the people of Lakewood. I also learned more about Lakewood's recent history, how in a nasty racially charged recent election cycle due to ostensible concern about "crime" the City's elected officials had taken steps like embracing long discredited and racist "Breed Specific (anti-Pit Bull) Legislation" and even gone so far as to puprosely dismantle every public outdoor basketball court in Lakewood for fear of attracting the "wrong element." There are so many issues and events happening in this city, and when I moved to Lakewood close to three years ago this October, there was one person I knew who respected people and got around issues and causes that people supported simply because he cares about the community he lives in. That person is Tristan Rader. Letter to the Editor - Wagar Park Extension Onto Rosewood Ave. I submitted the following letter to the Mayor and my councilpersons, and received a reply from Tom Bullock who met with me at the park. He stated that the city would "probably" pilot the art installation and observe the impact of the traffic diversion for a year. My impression from him was that there have been no objections to the closing of Rosewood Avenue at Park Place and that no concerns for convenience or safety (including timely emergency access) have been expressed by the residents of Rosewood, Orchard Grove or Park Place. Any area resident, recognizing that north-eastbound traffic on Hilliard now has an additional 3 traffic lights and 6 turns to navigate before it reaches Rosewood, should have something to say about it. I share my objections and concerns here, hoping to persuade others to seriously consider the situation and speak up too. The photo of Councilman-at-Large Bullock that ran with Ryan Puente's story on the councilman's re-election campaign launch may not sync with the memories of those who attended Congressman Kucinich's October 2015 press conference about saving Lakewood Hospital. There seems to be two different Lakewoods: the one that currently exists and the one that is currently being crafted by an ecosystem of political and economic interests. The first Lakewood is eclectic and doesn't shrink from different people, ideas, cultures, or music. It is neighbors who can lean over while sitting on their porch and talk with each other. It values homegrown businesses. It is this paper. It is Birdtown. It is the beautiful library. It is the bars and music scene. Tom Collingwood's letter calling for Lakewood Police officer Kevin Jones' immediate termination was right on point, highlighting the lack of leadership in Lakewood PD and in this City, which instead of doing the right thing is concerned about covering its derriere. Moving Back To Lakewood Meant Moving Back To Great Schools! My husband and I live at the West End of Lakewood with our three children -- a daughter at Lakewood High School, a son at Harding Middle School, and a daughter at Horace Mann Elementary School. Our two older children started out at Lakewood City Schools but we soon moved to Tiffin, Ohio for my husband's job. We missed the wonderful community spirit Lakewood has to offer, and we especially missed the schools! Moving back has been a joy and so important to our family. I've been doing a lot of research lately on dogs. As an animal photographer, I do my best to research all breeds so that I have a full understanding of them. It's helpful to go into a session having a good feel for a dog's disposition. Lately I've been researching dog bite stats. I get my information from the local news and the internets. I see the pit-bull maulings. And lately, I've noticed many more Labrador Retriever bites. For some reason, these news websites differentiate between the dogs. When a pit hurts someone, it's called a mauling. When a lab or other dog hurts someone, it's typically called a bite or attack by the news. Hello, I’m Sean McGuan. I’ve taught fourth or fifth grade in Lakewood City Schools (LCS) for 24 years. I am not a native of Lakewood but I am a native Clevelander and have lived in Lakewood for 25 years. I married my college sweetie from freshman year and we have two children at Lakewood High, a junior and a sophomore. With May being the month of Teacher Appreciation Week, I wanted to write this article to reflect and share my ideas about what continues to motivate and make me value being a Lakewood teacher. I recently read in the Plain Dealer, that Judge John O’Donnell had been seen “engaged in some light moshing” at the House of Blues. Now, "moshing" means to deliberately jostle with other dancers. It’s a highly energetic experience, and I truly hope he enjoyed himself! But, I got to wondering when he might put some of that energy to work on his court cases. Well, actually... one court case in particular. Thanks for your attention to our grievance about Lakewood’s $1.8 Million ordinances obligating us to the “cliff erosion protection” project. As you know, even the ODNR doesn’t recommend this at this time. Coastal seawalls and revetments etc, harm shores, lake water and won’t assure the prevention of cliff collapse. With these type of ordinances, President Trump’s $0 funding for Great Lake Protection, and Trump's denial of climate change, the multibillion dollar industry our lakes provide is greatly threatened. At the previous city council meeting, Councilmember O’Malley addressed the potential of allowing state licensure for the sale of medical marijuana in the city of Lakewood. He and the Public Safety Committee expressed the concern that opening a dispensary in Lakewood in the middle of an opioid crisis would promote drug usage, rather than reduce it. Since I started my campaign for Lakewood City Council this year, I have had the chance to speak with many current and former Lakewood residents. One of the major themes that keeps rising to the surface is Breed Specific Legislation [BSL]. This is the ordinance passed here in 2008 placing harsh limits on pit bull ownership within city limits. Some measures were taken to lower fines and waive registration fees, but this really isn’t enough. I am 100% on the side of those who want this ordinance repealed entirely. Last week a friend of mine told me about how she ended up in Cleveland. She had lived in Lakewood for a few years, got a pit bull puppy, then became aware that Lakewood restricts pit bull ownership. She told her landlord, thinking that she would simply have to register her dog, pay a fee and that was it. Unfortunately, the next week she was served an eviction notice, citing the BSL ordinance. On February 7, 2017, a historical and hysterically heartbreaking Senate vote gave the OK to approve another unqualified billionaire, this time to be appointed as the U.S. education secretary. Betsy DeVos’ nomination was surrounded by much controversy due to her lack of experience with public schools, a terrible performance during her confirmation hearing, and a host of other disqualifications. In the summer of 2016, the City of Lakewood passed Ordinance (25-16) with a cost above $704,000 for the Meridian Condo’s shore cliff "erosion protection." It did this without owner votes and in spite of over 54 owners' signed objections. These owners brought to City Council top international geotechnical shoreline expert, Dr. R. Young, who during open council, advised that a shoreline cliff project is not indicated at this time and its design will not prevent potential collapse of its cliff (video A, B). City Council ignored him, ignored the condo’s hired engineer (Lewin and Assoc. firm) as well as top experts' correspondence who concurred with Dr. Young (C). In January 2017, the City of Lakewood passed another Ordinance. This, for over $1,100,000. Ordinance (57-16) for “shoreline/cliff protection” for the Winton Place condo which is next door to the Meridian (the cliff is shared by these adjoining condos). Owners who oppose the cliff project hired top Cleveland attorney, Majeed Makhlouf, ex-Law Director of Cuyahoga County, who put condo boards, ODNR (Ohio Department of Natural Resources) State officials and City Council on legal notice that they were violating condo, municipal, state and federal laws and ignoring multiple experts' advice (D). 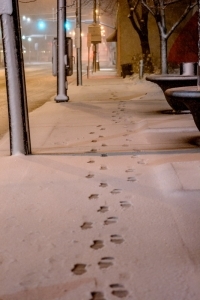 Officials, Boards and City Council ignored these. As an advocate for domestic violence awareness and prevention, I want to acknowledge all of the dedicated, bipartisan legislative accomplishments that our Ohio Congressman and Senators have done and continue to do to help prevent gun violence in our communities. In 2016, Ohio enacted a law prohibiting violent career criminals from buying, possessing, or carrying a gun. Ohio also requires a firearm owner to report the loss or theft of any firearm in the person’s possession or under the person’s control. An open letter to all former employees and trainees of Nature's Bin/Cornucopia Inc.
As "The Bin" closed it's doors for good on November 12, 2016, may we take some time to recall old memories. In my heart, "it's see ya soon" from this Bin grad. For others …hearts are broken, as this is a funeral of an institution that provided work and friendship for so many. Please remember that when one door closes, another will open. New, exciting adventures await. Just like little kid's, "let's embrace this new era of uncertainty with wide-eyed eagerness, optimism, and willingness to venture into the unknown." It has been said that people get the government they deserve. This may be true. Many Americans who are more interested in the performance of their sports teams than they are in their government. A democracy can't work unless citizens take part in it. They should take the time to learn about candidates' qualifications and evaluate issues. They should be concerned that all citizens should be able to vote and that everyone's vote should count. That is far from the case in the U.S. today. Even in presidential years voter turnout is abysmally low. I write to you as a dear friend whose community interests I looked after for many years. There is simply no legitimate justification for closing Lakewood Hospital, unless you believe the financial interest of Cleveland Clinic is superior to the public interest of the people of Lakewood in having a community hospital to call its own. Though officials have moved ahead to make the hospital closing a done deal, the people have a right to undo the “done deal” by voting “No” on issue 64. I urge you to do so, to stand up for Lakewood, stand up for community, stand up for 108 years of public ownership of the hospital and stand up for Lakewood’s future where young families and elderly families alike have close access to a life-saving community hospital they can call their own. There is no more respected voice in Lakewood on issues of sustainability, health and local resilience than Lakewood Earth and Food Community (LEAF). The deal that closed Lakewood Hospital impacts all of these issues, in predominantly negative ways. I would like to ask LEAF’s members to consider joining opponents of this deal, which voters will confront in November as Issue 64. I was on Lakewood Council in 1996 when we worked with the Mayor and Law Director to craft a document assuring that Lakewood residents had continuing access to quality health care services. At that time, Lakewood Hospital became part of “Cleveland Clinic West” which included Lutheran and Fairview hospitals. The Clinic was expected to operate Lakewood Hospital, enabling our hospital to continue to thrive in the rapidly changing health care market. Protections for Lakewood Hospital and flexibility for the Clinic were included. How Has Donald Trump Made It This Far? The beautiful homes were torn down over 50 years ago. All the sidewalks and trees were removed. The neighborhood was torn in half. Lakewood is on a roll due in large part to the wisdom of her residents. The schools are strong, which contributes to making the housing market one of the hottest in the region. We have lovely parks and a wonderful arts community. The vision of responsible city leaders, together with the hard work of residents, has made that happen. “NO ENDORSEMENT”!! Exactly one half of the unusually large crowd at the Thursday, September 29th, 2016 meeting of the Lakewood Democratic Club breathed a sigh of relief; the other half was mostly silent, but most likely grimaced in frustration! “No endorsement” was the result of the vote taken at this meeting of the Club on Issue 64, the referendum on the ballot in November to either “save Lakewood hospital”, or move forward into the 21st century with a state-of-the-art Family Health Care Center based on the healthcare needs of the demographics of Lakewood and its immediate surrounding area! Yes, each side had exactly half the votes cast For and Against and a number of members had also cast votes to Abstain. An incredible phenomenon that many in the room who had expected the Club to endorse the view of the “Savers” (an epithet by which they have come to be known over this rancorous and divisive year in Lakewood) did not think would happen. February 5, 2016: You receive notice that you must vacate your home; no one else is allowed to occupy the dwelling that used to be your home. November 9, 2016: You receive notice that you must bulldoze your home; you are responsible for all costs. In December 2015, when Mayor Michael P. Summers and City Council voted for a Master Agreement that shuttered Lakewood Hospital, they placed the City of Lakewood - your home - into this exact position. In August 2007, Fred M. DeGrandis (then President and CEO of Cleveland Clinic Regional Hospitals) wrote that by 1985, Lakewood Hospital was the last city-owned hospital in the state of Ohio. Therefore, if you live in the city of Lakewood, you are ‘part-owner’ of Lakewood Hospital. There are many in Lakewood concerned about not having a full-service hospital in the city. There are others upset about the loss of Lakewood's largest employer and the millions in lost tax revenue. However, this didn’t move me to get involved. However, when I saw what was really happening behind the scenes… I quickly became an activist for this cause. When it came to closing the Lakewood Hospital, the Cleveland Clinic saw an opportunity to save money and increase profits. For them, there are simply too many Medicare and Medicaid recipients in and near Lakewood. Too many senior citizens and single mothers. Too many people working two or even three jobs to make ends meet without any healthcare benefits. Too many under-insured young people, just starting out on their own (and I was one of them.) The Cleveland Clinic views these groups as liabilities. They'd much rather move the capacities of Lakewood Hospital to Fairview and Avon, where they are likely to increase Clinic profit margins. On the November 8th General Election ballot, Lakewood voters will have their first and only opportunity for a direct vote on the deal that closed Lakewood Hospital. It will appear as Issue 64 with options for or AGAINST Ordinance #49-15. Like many of you, I believe in the values of fighting for Lakewood, of fairness in regards to the proper use of taxpayer assets and providing residents with the services necessary for a healthy and active city. This is why I fought to ensure that the Cleveland Clinic provide Lakewood with 21st Century health care in the form of a state of the art Family Health Center and fully accredited 24/7 Emergency Room to serve residents long into the future. Lakewood voters have a choice this November: a state-of the-art family health center with a 24/7/365 emergency room and dozens of outpatient health care services at the same convenient downtown location--or yet another lawsuit. Lakewood Hospital has now been closed as an inpatient facility since the end of January. Employees have been successfully relocated. Business in Lakewood is thriving. Our housing market is experiencing a boom. People want to live here. The doom and gloom predicted by the Save Lakewood Hospital group is simply not coming to fruition. As a resident who lives near Wagar Park and goes there regularly with my young children, I was thrilled to learn that the city was planning on redesigning this space. I attended the second “re-envisioning” meeting for Wagar Park, where the three new park design concepts were unveiled to the public for the first time, and was disappointed that the two groups which seem to use the park the most (families of small children and middle school children) where not in attendance, most likely due to the time of day that the meeting was held (dinner/ bed time). In response to this deficit of input, I hosted my own informal meeting on August 23rd to ask other parents what they would like to see in the new Wagar Park and their opinions of the three concepts put forth by the city. These were my findings. Lakewood insiders who orchestrated the closure of Lakewood Hospital, boldly handing over its $150M in assets to politicians and private corporatists for pennies on the dollar, have resurfaced as “Lakewood Voters for Progress” ahead of the November 8 referendum. Formerly known as the discredited dark money group “Build Lakewood,” this new group is comprised of many of the same City of Lakewood politicians and Lakewood Hospital Association trustees that opponents say acted in violation of their fiduciary responsibilities to the hospital and its citizen-owners.